Football Program. He grew up in Colorado and graduated from Green Mountain High School where he played free safety and wide receiver. He attended Adams State College where he earned his BS degree. At Adams State he played wide receiver and twice earned All-Conference academic honors as a wide receiver. Prior to coming to Chatfield he taught and coached at Columbine High School and Green Mountain High School. Coach McGatlin has a Masters Degree in School Administration and teaches Physical Education. He is also an Assistant Track Coach. Coach McGatlin values time with his family: Tracy, his wife, and their three children: Blake, Ella, and Kenzey. Starting his sixth year at Chatfield, Craig Aukland is a graduate of Bear Creek High School where he played football and was named an All Colorado Wide Receiver. Coach Aukland played Wide Receiver and Defensive Back while attending Western State College in Gunnison. He teaches Physical Education and coaches Basketball at Chatfield. Craig and his wife Hollie keep busy with their young sons Payton and Braylon. 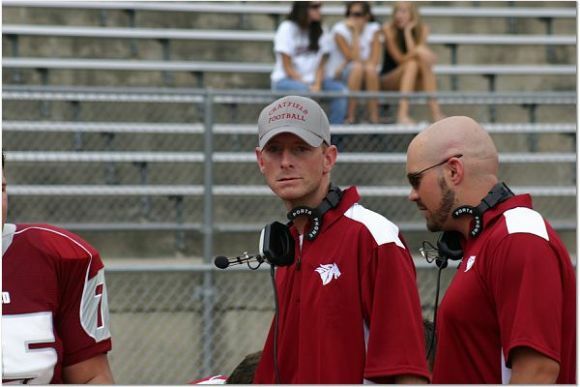 Coach Bergdale is returning for his fifth year on the Charger staff. This year, he will coach the defensive line. Coach Burger will be starting his fifth season on the Varsity level coaching the Quarterbacks after working with the freshman program for three years. Coach Burger graduated from Bear Creek High School where he played football and baseball earning 2nd Team All Conference honors at Quarterback. He went on to the University of Denver to play baseball on scholarship. Coach Burger is self-employed as a manufacturers rep for engineered material handling equipment and lives in High lands Ranch with his wife Cheryl and two children, Morgan and Evan. Coach Clements starts his seventh year of coaching football at Chatfield. He is originally from Michigan where he was a three sport letterman at Howell High School. While there he earned All Conference, all City and All State honors his Junior and Senior years in Football at Linebacker and Fullback as well as being named All Conference in Basketball and All State in Track. He still holds his high school record for discus. He played football at Western Michigan University on a scholarship. He lettered all four years and was All Conference and Defensive Player of the Year both his Junior and Senor years. He has coached previously at Western Michigan University (eight years football and two years track) and also had coached Chatfield Track for four years. Coach Clements earned his BS in Computer Science with a Math Major and a Physics Minor. He currently works as a Senior Systems Analyst at Lockheed Martin. Coach Clements and his wife Tammy have three children; Daniel, who attends CU, Amanda, who is a sophomore at Chatfield and Andy (Chatfield Class of ’07) who plays football at Colorado State University. When not coaching football, Coach Clements enjoys helping others, on-line gaming, and developing software. Coach “Gordo” begins his fifth year coaching the “Rhinos” as he affectionately refers to the Offensive Linemen at Chatfield. Prior to coaching at Chatfield, he coached Football for five years at Green Mountain High School. Coach Gordon graduated from Green Mountain High School and was an Offensive Tackle playing for Coach “Mac” McGatlin’s ’95 State Championship team. He attended CU and Metro State College where he earned a degree in History and Education. He currently teaches Social Studies at Conifer High School. Coach “G” begins his third year coaching at Chatfield. He moved to Colorado from New York twelve years ago but has lived in Oregon, California, and Connecticut. While in high school he lettered in Track & Field. He attended Marist College in Poughkeepsie, NY and earned his BS degree. He played rugby and was named to the Metropolitan NY Rugby Football Union All-Select Side from his sophomore through his senior year of college. He spent and extra year at the college and coached the first ever Marist College Women’s Rugby Club. He has a Masters of Arts degree in Higher Education Administration from New York University. He currently is attending Metro State College of Denver to gain a teaching license in Social Studies and Science. He works as a substitute teacher for Jefferson County. He lives with his wife Jacque, daughter, Kylee Marie, and dog, Yukon, in Lakewood. Coach Ingels has been playing football since he was 8 years old. He played high school football at Columbine where the team won a State Championship. He played a year of football at MSU – Northern and CSU Pueblo. He has been coaching for five years and this is his first year with the Chargers. His brother, Zach, is also a coach with the Chargers. Coach Ingels in 20 units shy of a Bachelor’s Degree in Video Production. His interests include back country snowboarding, hiking, boogie boarding, and spending time with family. Coach Ingels is 29 years old and this is his first year on the Charger Coaching staff . He has been involved with football for 20 years as either a player or a coach. Some of his hobbies include golfing, snowboarding, listening to music, spending time with friends and family. Coach McGatlin has a long and distinguished history as a football coach and is the father of Chatfield’s Head Coach, Bret. He was a 2-time State Championship Coach for Football and 3-time State Champion for Track at Green Mountain High School before leaving his ranch in Lakewood to “retire” in a more sprawling ranch in Rush, Colorado. Upon his arrival he took on the job of coaching the Miami Yoder High School team for the past 4 seasons. They won The Black Forest Championship and made it the quarter finals the following year - the first time in 100 years the school had back to back winning seasons. Coach McGatlin hosts the Freshmen team for their annual summer camp. Coach Nelson has been coaching football for three years and this is his first year with the Chargers. He attended Green Mountain High School where he received the Jerry James Award and was 2nd Team All Conference. He moved to Hawaii for a year to run and take over the family contracting business. He has been in the contracting business for six years. He is currently the owner of Nelson and Sons Plastering. His hobbies include wake boarding, snow boarding, working out, and traveling. Coach Shaffer will be starting his fifth season at Chatfield, third as Varsity Offensive & Running Backs. He was previously the Head JV Coach. Coach Shaffer is a graduate of Green Mountain High School where he was on the ’99 State Championship team. He was named MVP of the 4A State Championship game, 1st Team All State, Jeffco League MVP and Colorado 4A Player of the Year. Coach Shaffer graduated with a BS in Management from the Air Force Academy in 2004 with honors on the Commandants List. A three-year starter and Captain his senior year, he was the 7th fullback in AFA history to gain 1000 yards in a career. After completing his military commitment with the Air Force, Coach Shaffer returned to Jeffco and is currently working as an Engineering Planner at Lockheed Martin. When not playing football he enjoys watching football, golf and working out. Coach Anderson is in his 30th year of coaching. He started coaching in 1980 and is an elementary P.E. Teacher. He is married to his beautiful wife, Yvonne. Coach Anderson graduated with a B.A in 95 and got his masters Degree in 1999. In addition to coaching, Coach Anderson also enjoys cooking. This is Coach Davidson’s 4th year coaching football. He is married to Jennifer and has a daughter, Jordan, that just graduated from Chatfield and will be a Freshman at CU Boulder, as well as a son, Lander, who is a Freshman at Chatfield. Brett owns a successful real estate firm with his wife. Life is Good! Coach Gilbert has been coaching for seven years at the youth level and joins the Chatfield Senior High Coaching team this year. He has a son, Brayden. Coach Gilbert completed two years of general studies at Arapahoe Community College and is EMT Certified. His hobbies include skiing and motocross. Coach Fabian starts his second year with the Chatfield Chargers and has also coached Track & Field, High Jump. Coach Fabian graduated from Chatfield in ‘07 where he played four years of football as linebacker, defensive end and long snapper. He was named “Defensive Player of the Year” while at Chatfield. Coach Fabian participated in Track & Field for 4 years, in the 400, 400 relay (state qualifier), and as a high jumper. His hobbies are hiking, camping and playing basketball. Coach Fabian says that his senior year playing for Coach McGatlin confirmed his career goal to become a high school teacher and football/track coach. He spent the year after graduation interning at Windy Peak Outdoor Lab, and spent two years in Brazil in service. Coach Lowe is the youngest of three boys. He received 10 Varsity letters (football, swimming and track) during his high school years at Flat Rock High School in Flat Rock, Michigan. He was part of the Water Polo Club at Ball State University. He is married to Katina. Coach Lowe received his B.S. in Philosophy from Ball State University in Muncie, Indiana in 2003. He is currently working on his Masters Degree in Christian Studies from Denver Seminary. His hobbies include mountain biking, Clint Eastwood movies, and rooting for Michigan Football and Ball State Basketball teams. Coach Sage is starting his second year with the Chatfield Chargers. He has coached seven years of youth football for the South Jeffco Hurricanes. He graduated from Standley Lake High School in ‘90 as part of their first graduating class. While there, he played football as a Wide Receiver. He also lettered in swimming and basketball in high school. Coach Sage attended the University of Nevada Reno and Metro State College, playing Club Volleyball for both schools. When not coaching football, Coach Sage enjoys golf, volleyball, running and watching his kids play sports. Coach Sage and his wife, Karen, have four children: Colton, who is a senior at Chatfield, Daeden, a Sophomore at Chatfield, Payton who is in 7th grade and McKinsey who is 3rd grade. He is the owner of 5280 Roofing and Exteriors.